The New Mexico Bill of Sale Forms are considered legal documents that will prove that a legal sale of any item to include but not be limited to a vehicle, vessel/boat, firearm or any type of personal item(s). These documents will also prove change of ownership and provide information with regard to the seller, buyer as well as any identifying information of any item(s) being sold and purchased. Some documents will require notarization. Firearm Bill of Sale – To be used to prove the legal sale and purchase of any type of firearm between dealer and individual or two private parties. General Bill of Sale – This document is most generally utilized between two private parties to prove the legal sale and purchase of personal items. 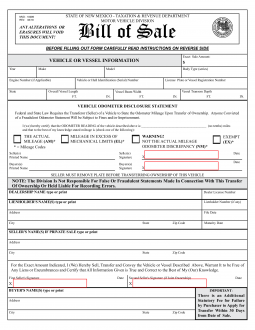 Vehicle/Vessel Bill of Sale – This form will prove the legal sale and purchase of either a motor vehicle or vessel/boat, The form is the same for both types of sale and purchase. This will prove change of ownership and will only require notarization if both parties wish it to be so. This document is likely to be required for registration of a boat and/or motor vehicle. Complete the “Release of Lien” section found on your title. It will be important that you take the time to call the Motor Vehicle Division (MVD) office that you intend to use for registration of your vessel to inquire as to whether or not, they may need to see your boat in person. All offices vary with regard to this particular requirement. Provide a bill of sale and proof of identity.